Seven news organizations in Colorado and New Mexico have teamed up for a six-month series, "Small Towns, Big Change," about rural Western communities as part of a project through the Solutions Journalism Network, Leah Todd reports for High Country News, which is participating. "Many small communities across the Mountain West are confronting complex challenges. How to grow a robust economy and create good jobs without sacrificing the qualities that make a place special? How to navigate competing claims on quality of life, so towns don’t become just weekend playgrounds for the wealthy? How to foster happy, healthy families in rural areas plagued by entrenched poverty?" The project "will produce stories that not only examine problems, but also surface and assess emerging responses to those issues," Todd writes. "We hope to catalyze discussion about what works, what doesn’t, and how people, institutions, and communities might change things." Matt Hildner of the Pueblo Chieftain reports about how a ranch sawmill hopes to improve the health of forests in rural Colorado. 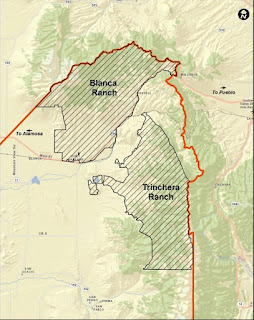 "Overgrown and insect-infested forests aren't unique to the Trinchera Blanca Ranch (Integrated Land Services map), known locally as simply the Trinchera. But its response has been uncommon. Last fall the ranch began seeking state and local approvals for a timber mill that could take wood off its ailing forests. It's currently under construction and slated to open for test runs this fall. 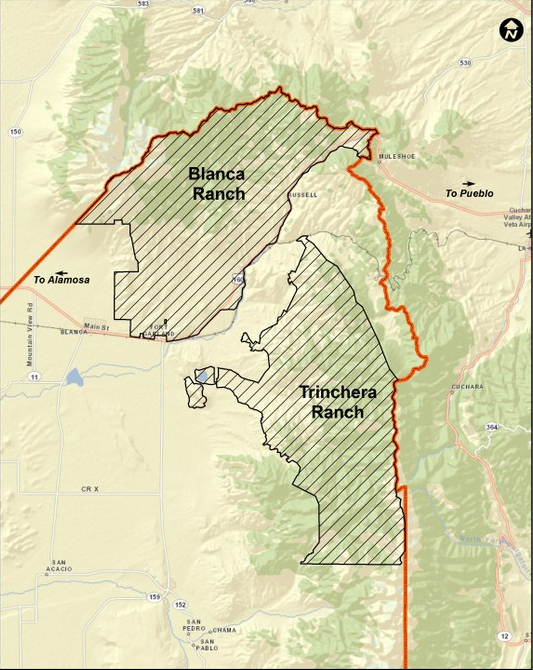 "If it opens according to plan, the mill could help improve the health of the Trinchera's forests and boost the struggling economy of Costilla County (left), where it could become the largest private employer. The mill's influence could also extend down the Sangre de Cristos Mountains into New Mexico and to a small part of the San Juan Mountains thanks to its capacity to handle both small diameter timber and larger-scale timber." In a story on how rural New Mexico towns share water during a drought, J.R. Logan of the Taos News writes, "Most Western states, including New Mexico, have water law founded upon the notion of 'prior appropriation,' legal jargon that loosely translates to 'first come, first served.' Under existing law, each water user is assigned a water right that includes a 'priority date' meant to reflect when water was first put to some kind of use. If your priority date is older than your neighbor's, you get first dibs when there’s not enough to go around―even if that means leaving your neighbor dry. It’s an antagonistic system that pits water users against one another." The Lebanon Enterprise, a weekly newspaper serving the geographic center of Kentucky, supports an extra school tax of 5 cents per $100 worth of property that the Marion County Board of Education voted to levy for construction and renovation of schools. Last published the names and addresses of more than 1,500 county residents who signed a petition to subject tax to a referendum, and this week Publisher Stevie Lowery defended that. "Some people have questioned the newspaper’s motives for publishing the information," Lowery writes, first denying a rumor that the school superintendent "put me up to this. That’s laughable. Anyone who knows me well enough knows that claim is absolutely absurd." The paper didn't do likewise with a similar petition in 2007, which resulted in a referendum vote that killed the tax. Why? Lowery writes that it "was a brand new issue for this community, for me and for this newspaper. Back then, I didn’t take into account that the recallable nickel petition is, in fact, a public record." Lowery, left, said the paper had a responsibility to publish the petition because it's "a serious matter" that shouldn't be "taken lightly" and people have a right to know who signed it. Also, "According to several phone calls we received here at the Enterprise, the people gathering the signatures didn’t fully explain the purpose of the petition, and in some cases, people were allegedly lied to when they were asked to sign it. One person told my staff that when she was asked to sign the petition she was made to believe that the petition was in favor of the nickel, which it most certainly is not. We’ve also received several calls from people whose names appear on the petition, but they claim they did not sign it. I know of one specific person whose signature appeared on the petition, but she didn’t sign it. A family member forged her signature. I’ve spoken to this person directly, so I know this to be a fact." The Enterprise has a story about that. "Some people claim that our publishing the names and addresses of the people who signed the petition was a 'shaming' tactic," Lowery writes. "How so? If you willingly signed a petition because you felt like it was the right thing to do, what do you have to be ashamed of? If it’s something you strongly believe in, wouldn’t you be proud to have your name associated with it? . . . Some people claim that publishing the names and addresses of the people who signed the petition make them targets for retaliation. I don’t buy that. People who support the recallable nickel might try to educate the folks who signed the petition. And, educating is not retaliating." The Enterprise is owned by Landmark Community Newspapers Inc.
A tiny rural school district in Eastern Oregon has invited Portland students to spend a semester in Unity (Best Places map) to learn about agriculture and science, Eric Mortenson reports for EO Media Group, which owns 11 newspapers in the Pacific Northwest. 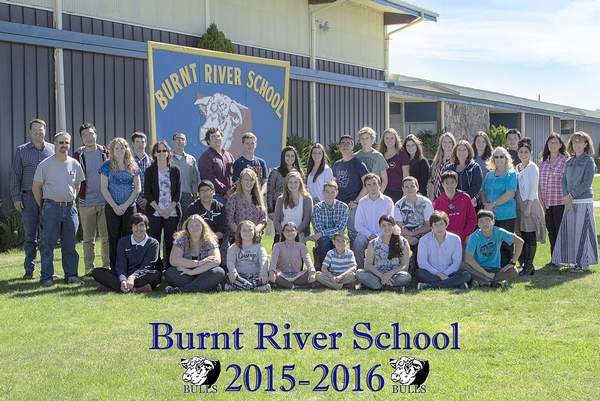 Burnt River School, which has 34 students in grades K-12, only has one building. 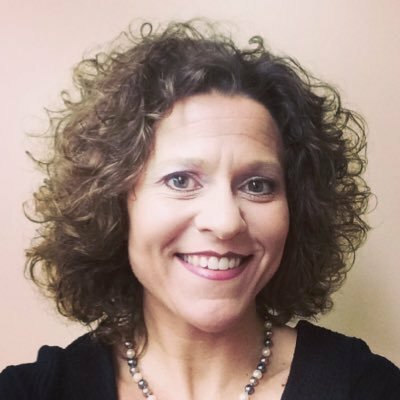 Lorrie Andrews, district superintendent, principal, teacher and career and yearbook adviser, said the move is meant to bridge the state's rural-urban divide. Burnt River is one of the state's smallest districts; Portland is the largest, with 49,000 students in 78 schools. Eight students will visit in the fall and another eight in spring 2017, Mortenson writes. "Portland students will get a semester of hands-on learning in what Burnt River describes as a 'variety of natural resource settings.' They’ll learn about animal production science, sustainable rangeland science and forest restoration studies, and do water quality monitoring with the Powder Basin Watershed Council." 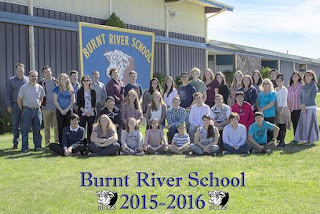 The move will also help Burnt River School's budget, with the Oregon Department of Education paying school districts a standard per-student amount of $7,100; Burnt River will get credit for the Portland students. Some jails and prisons that rural areas rely on for much-needed revenue and jobs are badly outdated and cramped, Phil Ferolito reports for the Yakima Herald. One example is in Wapato, Wash. (Best Places map) where a National Institute of Corrections report requested by Police Chief Rick Needham showed that poor conditions at the municipal jail put inmates and guards in danger. A new jail would cost millions, Ferolito writes. "On top of that, most of the jail’s inmates are from other communities, from as far as Puget Sound, who are housed under contracts that generate revenue the city has come to rely on to run the jail. Many of those contracts recently dissolved when other, less expensive jails became available. That’s creating a potential budget shortfall for jail operations, which typically cost about $900,000 a year. Contracts until recently generated about half that, from $450,000 to $475,000 a year." "It is a modest square of cinder blocks, perhaps 15 feet on each side, topped with an aluminum dome and minarets," Freedman writes. "Several hundred yards off the main highway, on the outskirts of a town with barely 200 residents about 60 miles west of Minot, the mosque and cemetery exist much as they always have, surrounded by fields of wheat and corn and grazing lands. In this spot, all the industrial clamor of North Dakota’s fracking boom feels immeasurably distant." "Amid a presidential campaign . . . that has coincided with a rising number of bias crimes against Muslim people and institutions, this little plot is a reminder that Muslims were here as far back as the Norwegians and Swedes and Germans and Finns and Poles and Jews among whom they settled," Freedman writes. 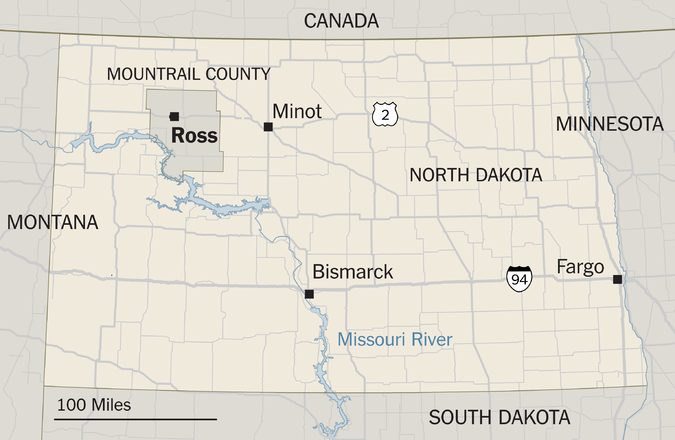 Despite being discriminated against early on in North Dakota, Muslims have now been welcomed in Ross, with a Christian group in 2005 helping to fund replacing the mosque after it was badly in need of repairs. Rural electrical cooperatives in the South lack diversity among their elected directors, says a study by the Rural Power Project, a joint project of Labor Neighbor Research and Training Center and the Association of Community Organizations for Reform Now. ACORN founder Wade Rathke writes for the Daily Yonder that the study, which looked at 313 cooperatives in the South, found that of the 3,051 democratically elected members, 2,754—or 90.3 percent—are men, with only 297 elected female members. Women make up 51.1 percent of the South's population. The study also found that 95.3 percent of directors are white, 4.4 percent black and 0.3 percent Hispanic, Rathke writes. The study report says "Many cooperatives do not have a way for regular members to gain access to the ballot by signatures, petitions, or floor nomination." Jeffrey Connor, interim CEO of the National Rural Electric Cooperative Association, told The Rural Blog in an email: "Electric cooperatives, under the cooperative business model, rely on open and transparent governance and the positive involvement of the communities they serve. We are member-owned and not-for-profit. Electric cooperatives bear a unique responsibility to meet the needs of their member-owners with safe, reliable and affordable power, as well as the cooperative principle of concern for community." Individual renters need to earn, on average, $20.30 an hour to afford a modest two-bedroom apartment in the U.S., says a report by the National Low Income Housing Coalition. "The national pattern—the minimum wage isn't really a 'housing wage' anywhere in America, even at 40 hours a week—hints at the difficulty of being a poor single parent," Emily Badger and Christopher Ingraham report for the Post. "And it's just the most dire expression of an affordable housing crunch affecting renters much farther up the income spectrum, too." Many of Pennsylvania's most remote hospitals are operating in the red, says a report released today from the independent Pennsylvania Health Care Cost Containment Council (PHC4) state agency. Overall, 29 percent of the state's hospitals are losing money, Steve Twedt reports for the Pittsburgh Post-Gazette. But numbers are grim in rural areas. For example, Ellwood City Hospital, a 70-bed facility in the eastern part of the state, has not reported a profit since 1998. The hospital, which is looking for an affiliation partner, recorded a negative 7.62 percent margin for fiscal 2015. 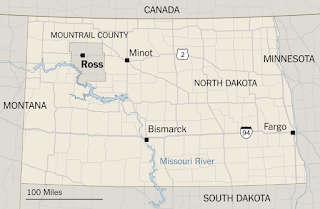 Other rural hospitals report similar losses, Twedt writes. Denis Lukes, chief financial officer for the Healthcare Council of Western Pennsylvania, told Twedt, “And these tend to be the only hospitals for miles and miles around. I think there’s a real need for some protection from across the state, just in terms of access to care.” Lukas said "the western part of the state gets hit harder because Medicare, in addition to its overall cuts, reimburses hospitals at a lower rate based on a formula that factors in hospital employee salaries." 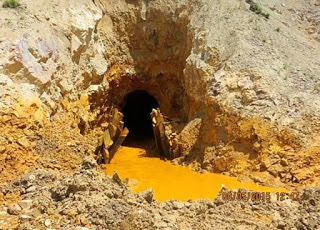 EPA, which does not comment on pending litigation filed by outside parties, said in a statement released Monday that "the agency takes responsibility for the mine spill cleanup and has been working to reimburse response costs and fund tribal and state monitoring plans as well as conduct its own monitoring of the Animas and San Juan rivers," Reed writes. The U.S. Department of Agriculture blames the ash borer for destroying tens of millions of trees nationwide, Eller writes. "Iowa has an estimated 52 million rural ash trees and about 3.1 million more ash trees in urban areas." 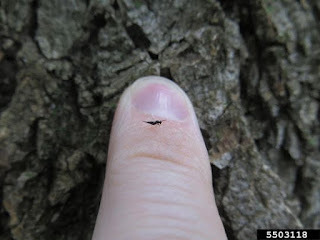 USDA says ash borer have been detected in 25 states: Arkansas, Colorado, Connecticut, Georgia, Illinois, Indiana, Iowa, Kansas, Kentucky, Louisiana, Maryland, Massachusetts, Michigan, Minnesota, Missouri, New Hampshire, New Jersey, New York, North Carolina, Ohio, Pennsylvania, Tennessee, Virginia, West Virginia and Wisconsin. Wasps have been used in most of those states to combat ash borer. 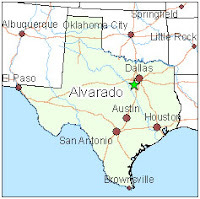 Officials say a new detention center in rural North Texas for transgender immigrants will improve conditions for transgender detainees, but critics say it will open the door for further abuse, Kate Groetzinger reports for Quartz, which is owned by Atlantic Media Co., publisher of The Atlantic. Alvarado (Best Places map), a town of 3,800 about 30 miles outside Dallas, will be the site of the Prairieland Detention Center, which will house up to 36 detainees when it opens in November, according to U.S. Immigration and Customs Enforcement. The only other such institution is in Santa Ana, Calif., which officials recently voted to shut down in 2020, following a report by Human Rights Watch documenting abuses of detainees at the facility. Prairieland "is the first to include a unit built specifically to house transgender detainees," Groetzinger writes. "According to ICE officials, the construction of a transgender unit in Texas is meant to improve conditions for transgender detainees. Transgender activists and advocates say it represents an expansion of an abusive system that can’t protect transgender individuals’ safety and rights. Prior to last year, the government had no protocol for handling transgender detainees, according to Flor Bermudez, a director at the Transgender Law Center." If rural votes were the only ones that counted in the November election Republican Donald Trump would win the presidency by a landslide. But Democrat Hillary Clinton leads 46 to 43 percent in the latest poll by NBC News and The Wall Street Journal, which found a bigger rural-urban divide than usual. 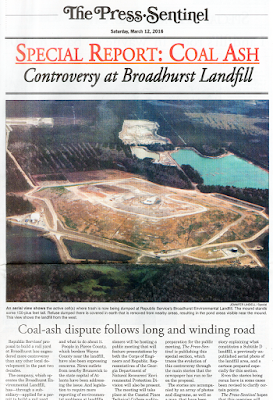 The Press-Sentinel, a twice-weekly newspaper in southwestern Georgia, has spent the better part of 2016 leading the crusade to stop coal ash from being dumped in a landfill in Wayne County (Wikipedia map), home county of Dink NeSmith, president of Athens-based Community Newspapers Inc., which owns the paper. Some say allowing coal ash in the landfill will boost the local economy through host fees and rail-yard jobs, but others fear the hazards of having toxic materials nearby. County Commissioner Mike Roberts, who said commissioners knew little to nothing about coal ash before the issue arose, said it will take help from state and federal officials to keep coal ash out of the landfill. He told Derby Waters of The Press-Sentinel that it's "the federal government we are fighting, and it’s not an easy fight. We won’t stop fighting it." Wayne County residents say they fear having coal ash in the vicinity, Candice McKinley writes for The Press-Sentinel. Local resident Judy Butts told her, "We didn't bargain for a mountain of coal ash. We settled in a place with few people and few distractions, because that's the lifestyle we wanted to live. We are scared now that we will no longer have that." The Press-Sentinel, which is behind a paywall, published a 20-page special section about the controversy on March 12. It included stories, opinions, cartoons, photographs, maps, public notices of meetings, letters to the editor, a timeline of events, a list of Wayne County officials and their contact information, and no advertising, making the section a big investment for the paper. It later ran a full page that included photos of local officials and their views of the proposal. The story began Jan. 4, when a South Carolina company applied to the Army Corps of Engineers for a permit for a rail spur to dump coal ash in 250 acres of the Republic Services landfill. Officials and residents in Wayne County were not informed of the permit application, despite a required public-comment period. The Corps, which merely put a notice of the application on its website, is involved because the applicant "proposed a discharge of dredged materials into almost 25 acres of jurisdictional wetlands," Waters wrote. "It proposed to construct at rail-yard operation including unloading structures, rail-car wash down stations, parking and an office." An environmental lobbyist told the newspaper he had seen the notice on the Corps website. 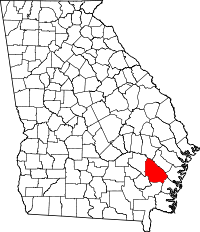 In January the county commission asked the Corps for a public meeting on the plan. Officials were concerned that the application was limited to basic information about the physical operation, but nothing about environmental and safety issues or where the coal ash and other materials would come from, Waters reported. Officials also met with Republic officials to find out more about their plans, and discovered that Republic is a subsidiary of Central Virginia Properties, the permit applicant. Commission Chair Kevin Copeland told Waters that Republic was opposed to a public meeting, claiming it was properly licensed to take in coal ash. In February the commission approved funding for a landfill study and the Corps extended the comment period, after prompting from state leaders. In March, Republic agreed to meet with county elected officials as part of an open house at the landfill. 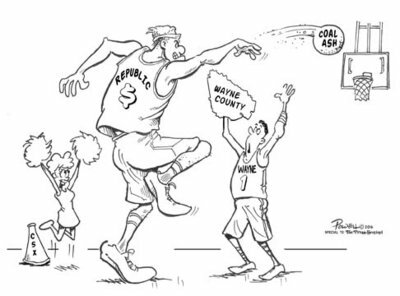 Meanwhile, The Press-Sentinel learned that if coal ash is dumped in the landfill Republic "could be faced with thousands of dollars in penalties for breaching the terms of timberland conservation easements it now claims when paying county property taxes," Waters writes. For the past seven years "the company has saved in property taxes by making use of conservation easements. The penalty the company could have to pay were all the easements removed at one time could be $326,406." Dwayne Powell has done many cartoons for the paper. The fight has already reaped some rewards, Drew Davis reports for The Press-Sentinel. Legislation by state Rep. Bill Werkheiser (R-Glennville) to require greater transparency, after an apparent leak in the landfill was never reported, was signed into law last month. "The bill requires landfill owners and operators to notify local officials and the county legal organ of toxic leaks." The fight is an example of the power and value of community newspapers that live up to their responsibilities. "If it is a newspaper’s duty to print the news and raise hell, the Press-Sentinel is answering the call and rattling Satan’s rafters," Teri Saylor reports for Publisher's Auxiliary, the newspaper of the National Newspaper Association. Records show that from 2007 to 2012 "AmerisourceBergen, the nation’s third largest drug distributor, shipped 60.9 million hydrocodone pills and 26.6 million oxycodone tablets to West Virginia," Eyre writes. "That’s 33 hydrocodone pills and 15.5 oxycodone pills for every man, woman and child in West Virginia." Also, H.D. Smith shipped 12.4 million hydrocodone pills and 3.2 million oxycodone tablets, Masters Pharmaceuticals supplied 1.5 million hydrocodone pills and 859,000 oxycodone pills and Top Rx shipped 1.7 million hydrocodone tablets. "West Virginia spends more than $430 million a year on problems caused by prescription drug abuse, according to the state’s lawsuit." Similar problems are found in neighboring states, such as Kentucky, which had 76 pain clinics in 2012, Van Ingram, executive director of the Kentucky Office of Drug Control Policy, told Rich Lord and Adam Smeltz of the Pittsburgh Post-Gazette. 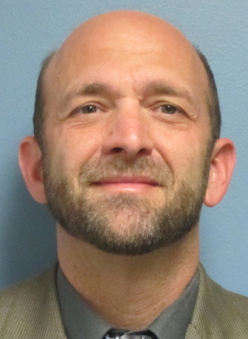 Melborne Williams, an Eastern Kentucky psychiatrist whose license was suspended, prescribed 1.35 million doses of the sedative Xanax in 2012, tops among the state's doctors, according to Kentucky's prescribing database. Danny Finley, coroner of Clay County, population 21,013, in 2012 classified 43 fatalities as drug-related. Finley told investigators that 11 of those deaths were patients of Williams. Shutting down pill mills hasn't stopped drug deaths, Lord and Smeltz write. When states began making it harder to get prescription painkillers, drug users switched to heroin, which has become cheap and easy to get. 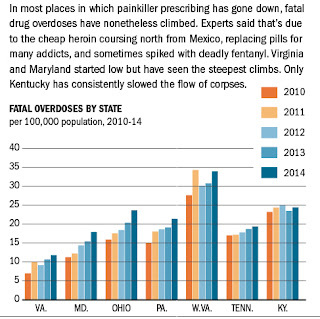 Seven states analyzed by the Post-Gazette—Kentucky, Ohio, Maryland, Tennessee, Pennsylvania, Virginia and West Virginia—all saw a rise in fatal overdoses from 2010 to 2014. West Virginia leads the nation in drug deaths. About 16 percent of the nation's population is rural, but rural areas only received 6 to 7 percent of private foundation grants awarded from 2005 to 2010, according to the U.S. Department of Agriculture. Those are numbers that need to change if philanthropies are going to make any progress, Justin Maxson, executive director of the Mary Reynolds Babcock Foundation, told Bestey Russell, a writer for the Daily Yonder. "Maxson said one problem is the assertion by some foundations that rural communities lack capacity to put grants to good use," Russell reports. "But that’s often more a matter of perception than reality foundations, he said." Maxson, who has been in Appalachia for 15 years, previously with the Mountain Association for Community Economic Development, told Russell: "I think there are a range of civic associations, non-profit organizations, and local leaders who bring skills from their work in all sorts of settings that translate into capacity to support changing those places. It’s hard for foundations to go deep enough to really learn a place. If you look across rural America, it’s a big landscape. It takes settling in a place and building relationships, scratching beneath the surface to understand that capacity, to resource it, to figure out what the needs are, and what the opportunities are in those places." "It’s not easy," he said. "I don’t want to pretend there’s a Harry Potter spell you can say. It’s not that simple. We spend a lot of time building relationships with partners and communities. We don’t pretend that we can be of a place, but we sure the heck can be authentic. We can ask good questions. We can listen well. We can, through local partners, build the connections that result in a better understanding of the place. We spend a ridiculous amount of time on the road. There is cost in that, to staff. There is cost in that financially. There’s cost in that in terms of our organizational culture, but I think it absolutely improves our grantmaking." "There aren’t easy bumper stickers about rural capacity," he said. "It’s there, but part of the endeavor is slowing down enough, and sinking into a place enough, and caring enough to scratch that surface. It’s not a matter of finding an easy way of talking about it, or of measuring the right things, or of lifting up the right evidence. I don’t think that’s quite it. I do know that if you want to win statewide on any issue, you can’t forget rural places. I also think there’s a moral argument that says, If people are important, you can’t think about injustice without acknowledging the plight and the opportunity in rural America. There are political arguments, climate arguments, and moral arguments about why rural America is important to creating a healthy country, and we’ve got to do a better job at articulating those." Organic agriculture boosts local economies, says a study by Penn State for the Organic Trade Association. The study looked at "225 counties considered organic hotspots—counties with high levels of organic agricultural activity that have neighboring counties with high organic activity—and then looks at how these organic hotspots impact key county-level economic indicators," OTA reports. 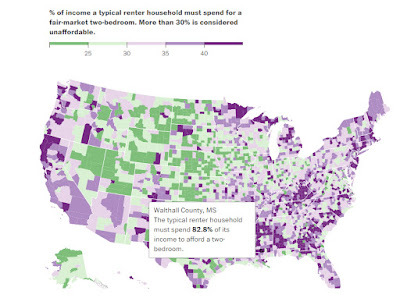 Research found that being in an organic hotspot increased median income household income by more than $2,000 and lowers a county's poverty rate by 1.35 percent. U.S. organic sales increased by 11 percent in 2015, Carol Ryan Dumas reports for the Western agricultural news site Capital Press. "Total organic sales in 2015 marked the fourth-consecutive year of double-digit growth, adding $4.2 billion in sales over 2014. Those sales represent a 209 percent growth since 2005, when sales totaled $14 billion." 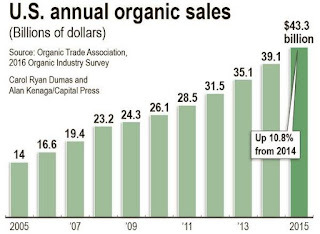 Last year "total sales of organic food and non-food products reached $43.3 billion, with organic food sales claiming about 92 percent of all receipts at $39.7 billion, according to the Organic Trade Association." Organic sales accounted for nearly 5 percent of all food sold in the U.S.
"Finding local stories in national and international news isn’t always easy. 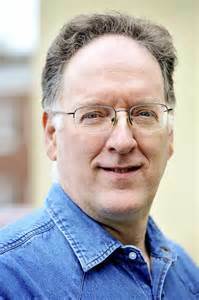 But many big stories have local angles, and the news organizations that make the effort can tell important local stories that the community will be talking about," veteran editor and reporter Steve Buttry writes on his blog, The Buttry Diary. "The local people with personal ties to these stories don’t appear in the places you routinely find news," Buttry says. "You won’t hear these stories on the scanner or see them on agendas or police blotters. But they are the biggest news of the day, sometimes the biggest of the year, in small circles of your community. And you often can learn of the stories with a few calls or social media inquiries," or crowdsourcing. Buttry acknowledges, as part of an online debate with Howard Owens, editor of The Batavian in New York state, that the "size of the story, size of your community and size of your staff all make a difference in pursuing and finding local connections. . . . A bigger staff can devote more staff time to pursuing local connections to national news." That caveat established, Buttry offers many examples of localization: "A local college or university has experts on national and international topics as well as exchange students from nations that might be in the news. . . . A military base also might have units deployed abroad and people who have been stationed in countries in the news. Or individual troops from your community might be involved in a military story. . . . Your local Red Cross or Salvation Army might be sending volunteers to assist in disaster relief ... or local religious groups might be helping victims of a distant disaster. . . . A large local company might have national experts in some of the topics related to its business." He suggests using LinkedIn's advanced people search engine to look for local experts and connections. One obvious angle is the local impact of big national stories. "Many national stories play out in each community, providing powerful local stories," Buttry writes, using his coverage of Omaha-area connections to the 1995 Oklahoma City bombing when he was a reporter for the Omaha World-Herald. He was named editor of the year in 2010 by Editor & Publisher for his work as editor of the Cedar Rapids Gazette, and is now director of student media at Louisiana State University. Localizing national stories is sometimes best done with data. "When Bill Clinton was trying to start a national conversation on race in 1997, I used local, state and national data to show how different life was, in nearly every respect, for black and white people in Omaha, Iowa, Nebraska and nationally," Buttry writes. "That story would be much easier today with much of the data you’d need readily available online." "In the ’90s recovery, less-populated counties accounted for more than 1 in 4 new jobs in the country," Tankersely writes. "In the recovery beginning in 2002, that had fallen to 1 in 5. In this recovery, it is less than 1 in 10. 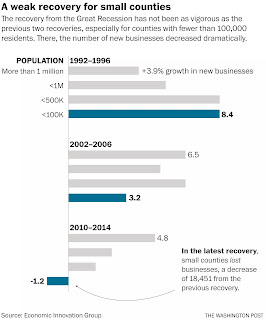 Nearly 2 out of 3 rural counties lost businesses, on net, from 2010 to 2014. That is up from just over 2 in 5 counties in the early 2000s and just under 1 in 5 in the ’90s. 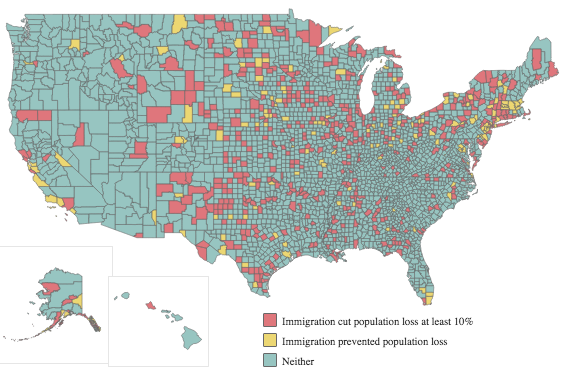 The counties shedding establishments span the country and include almost every variety of rural areas, from farming and manufacturing communities in Missouri to coal-reliant swatches of Appalachia to coastal counties in the Pacific Northwest where the timber and fishing industries have dwindled." According to data from a Brookings Institution's analysis of Moody’s Analytics the 100 largest metros in the U.S. recovered all the jobs lost—6 million total—during the Great Recssion, Tankersley writes. "The rest of the country, combined, was barely 300,000 jobs over its pre-recession peak." One problem is that "the sort of businesses and jobs they used to create in economic expansions simply aren't appearing at the same rate anymore, particularly in blue-collar industries such as construction and manufacturing," Tankersley writes in a separate story. The other problem is that six metros—San Francisco, San Jose, New York, Boston, Los Angeles and Washington D.C.—account for two-thirds of all venture capital money. Most of those companies are high-tech startups. 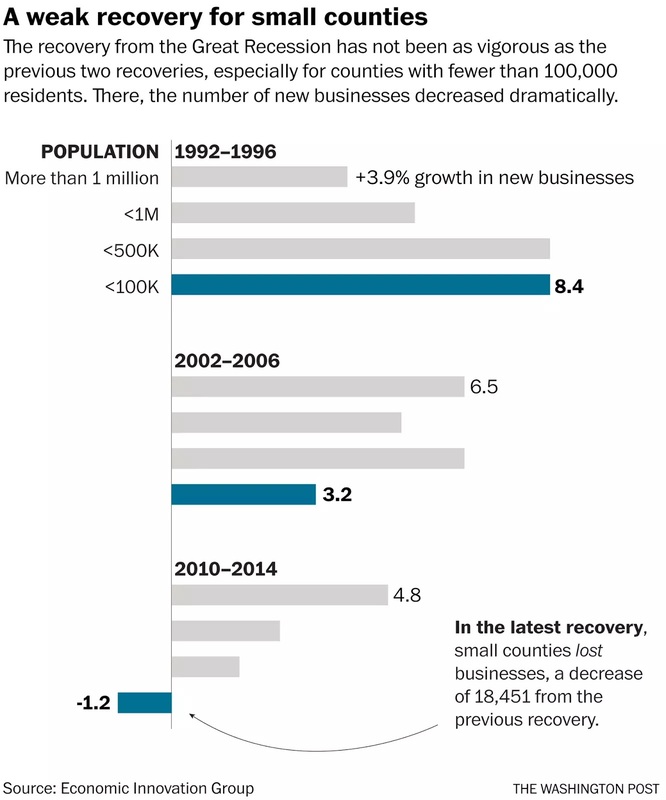 During the first five years of economic recovery 20 cities—mostly in Silicon Valley or New York City—combined for half of America's net new business formation. New rules created ostensibly to stop voter fraud are making it more difficult for poor, black, Latino and elderly Americans, particularly in the South, to register for elections, Sari Horwitz reports for The Washington Post. "In November, 17 states will have voting restrictions in place for the first time in a presidential election. 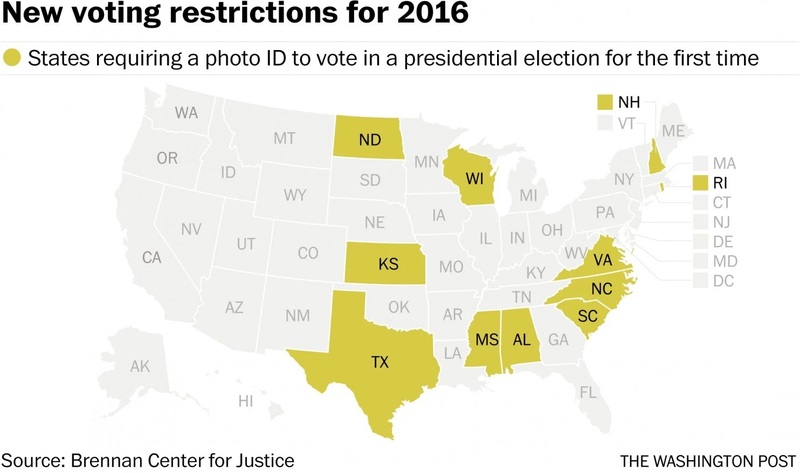 Eleven of those states will require their residents to show a photo ID. They include swing states such as Wisconsin and states with large African American and Latino populations, such as North Carolina and Texas. Many of the residents struggling to obtain a valid photo ID are elderly and poor and were born in homes rather than hospitals. As a result, birth certificates were often lost or names were misspelled in official city records." In Texas, which has one of the strictest voter laws in the nation, a federal court found that "608,470 registered voters don’t have the forms of identification that the state now requires for voting," Horwitz writes. 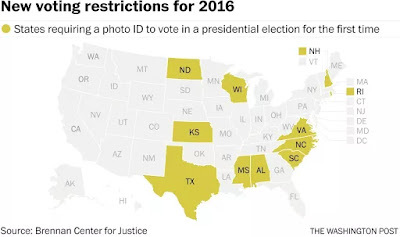 Overall, "about 11 percent of Americans do not have government-issued photo identification cards, such as a driver’s license or a passport, according to Wendy Weiser of the Democracy Program at the Brennan Center for Justice at New York University School of Law." University of California at San Diego researchers analyzed turnout in elections between 2008 and 2012, finding "substantial drops in turnout for minorities under strict voter ID laws.” The study's authors wrote: “These results suggest that by instituting strict photo ID laws, states could minimize the influence of voters on the left and could dramatically alter the political leaning of the electorate." James Branscome, who covered the Tennessee Valley Authority and strip mining for The Mountain Eagle of Whitesburg, Ky., in the 1970s before becoming managing director of equity research for Standard and Poor's, has a big idea that could revitalize economies in Appalachia hurt by the loss of coal jobs. "Anyone who has spent time in the mountains and hollows from Middlesboro, Ky., to Beckley, W.Va., understands that most of the land is owned either by coal and timber companies or the federal government with its national forests and parks," Branscome wrote in an essay appearing in several Appalachian newspapers. "Coal companies alone own 1.3 million acres in the Cumberlands of Kentucky and even more in the Alleghenies of West Virginia. The federal government is actually the largest single landowner in Appalachia." "With the region’s largest coal companies in bankruptcy or nearly so, I have an idea for Clinton and Trump: Let’s buy those bankrupted acres and release some of those federal holdings," he writes. "Then we can give the people something they have not had since industrialization and coal mining started in Appalachia in the 1880s — land. Land for farming, for gardens, for housing, for grazing cattle, horses and hogs, and for sustainable forestry." "Let’s call this the Appalachian Homestead Act, in homage to the federal initiative that helped settle the West and build wealth in the 19th century," he writes. "The Appalachian Homestead Act may be today’s best solution to the enduring problem of mountain poverty. And it may well be the most important opportunity for a new generation looking for a place to build an economy and a community that make sense in a time of global warming and economic dysfunction." 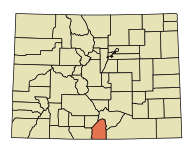 Branscome, who lives in Montrose, Colo., is a member of the national advisory board of the Institute for Rural Journalism and Community Issues, which publishes The Rural Blog. 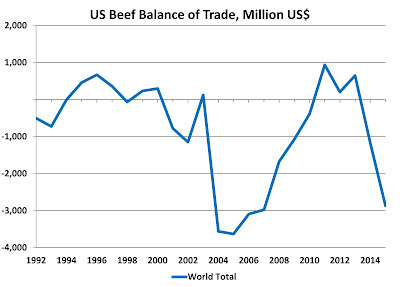 The U.S. Department of Agriculture is only highlighting the positives of trade in beef, obscuring the fact that the nation is importing more beef than it exports, Harwood D. Schaffer and Daryll E. Ray of the University of Tennessee write in their latest "Policy Pennings" column. 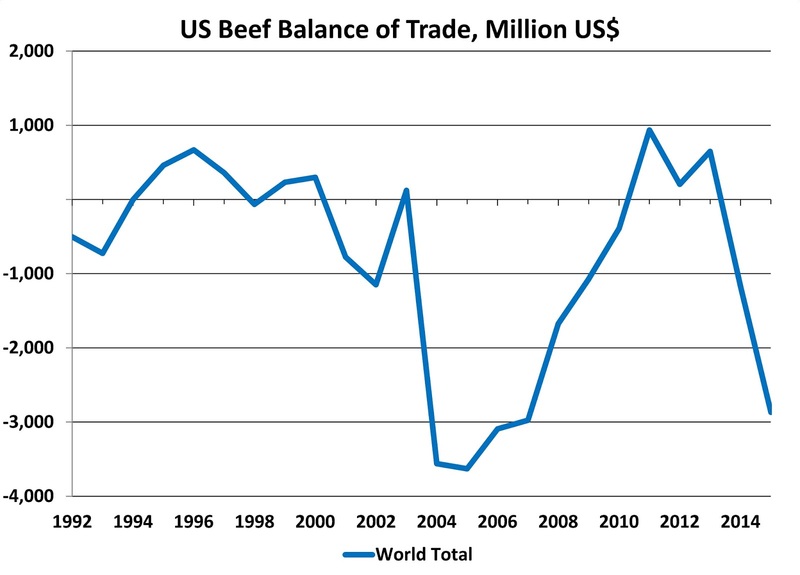 The April issue of Livestock and Poultry: World Markets and Trade (L&P), produced by the Foreign Agricultural Service and USDA, says "Trade of All Meats to Expand in 2016." For beef and veal it says "Exports by major traders are forecast 1 percent higher to 9.6 million tons as growth to Asia offsets soft demand in other regions" and U.S. "exports are expected to grow 8 percent as production expansion and declining U.S. beef prices spur demand. Lower Australian supplies will enable the U.S. to regain some market share in Asian markets. However, exports will remain below the 5-year average as the strong dollar continues to hamper shipments, especially to Canada and Mexico." 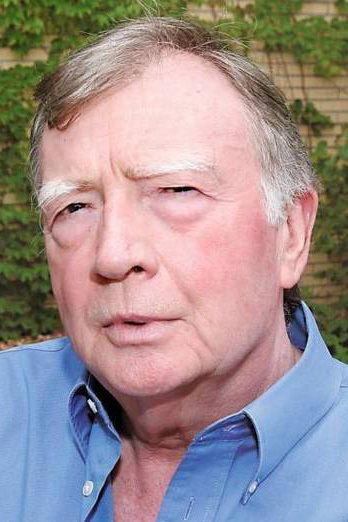 The Valley News, a daily newspaper in the Upper Connecticut River Valley, publishes a weekly feature called "A Life," in which the paper turns an obituary of someone with local ties into a fuller portrait of that person. On Sunday it featured Leonard "Baltimore Jack" Tarlin (Mike Sisemore photo), a renowned hiker who walked the entire Appalachian Trail eight times. Tarlin died May 3 at the age of 57. 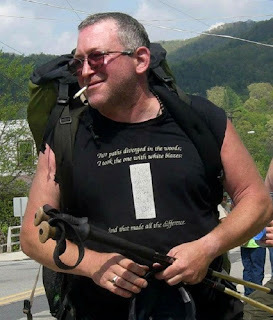 Josh Weinreb started the story this way: Mike Sisemore was heading north on the trail 17 years ago "and found himself on a slow-moving stretch up a hill in Virginia. About 100 yards ahead he saw a disheveled form. Another hiker, presumably, but this one was different. His backpack was crooked, with long straps hanging from its sides. His shoes were untied. He wore a bandana on his head. He wore black nylon shorts and a black T-shirt." "As Sisemore put it, the hiker was 'bouncing' along the trail," Weinreb writes. "And then Sisemore saw him fall, slip on a mud patch and front flip into a bed of rocks. When Sisemore caught up, the hiker was sitting on the ground holding his broken glasses. 'You got any tape?' he asked Sisemore in a grizzled voice. It was, Sisemore knew immediately, Baltimore Jack, a legend along the Appalachian Trail." The Valley News is based in Lebanon, N.H., just south of the trail's crossing of the river. 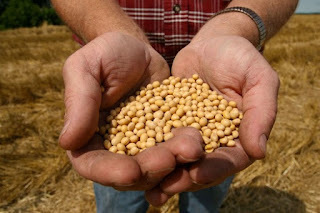 Concern about marketability the European Union is leading to fear that the new bean "will cause price declines, confusion and disruption in international trade," Meersman writes. "The reason it’s a risk is because unapproved soybeans and approved soybeans often get mixed together in grain elevators, unit trains or ships when they’re exported, and it’s difficult and expensive for grain buyers and sellers to try to keep them separate." How much do people in your state drink and dope? 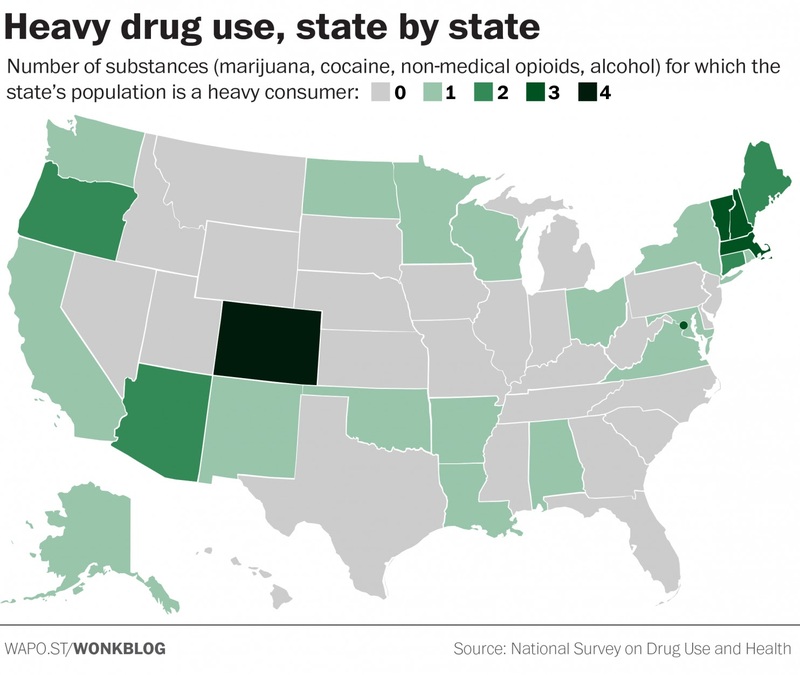 People in Colorado love marijuana, cocaine, alcohol and painkillers used for non-medical reasons. Colorado is the only state where residents rank in the top 10 in all four categories, according to a Substance Abuse and Mental Health Services Administration survey of the proportion of population 12 and older who use each substance, Keith Humphreys reports for The Washington Post. Reported marijuana use was highest in the states where it is legal—Alaska, Colorado, Oregon and Washington, Humphreys writes. "Vermont, Massachusetts and New Hampshire are leading consumers of alcohol, marijuana and cocaine, with Maine and Connecticut also being leaders in two of those three. New York, in contrast, is a top consumer of only cocaine." Three border states—Arizona, California and New Mexico—have high rates of cocaine use, while Arizona is also a leader among opioid use. The rural town of Syria, Va., is saying no to Syrian refugees and yes to Donald Trump. And a lot of the country feels likewise, Mary Jordan reports for The Washington Post. "Unlike its faraway namesake, this Syria has no Muslims. It’s a pretty village with trout in its rivers and black bears in its hills, home to many who cheer one of Donald Trump’s most derided proposals: a ban on Muslims," Jordan writes. Syria, which lies along the Old Blue Ridge Turnpike at the edge of Shenandoah National Park, is a Republican-leaning village of about 203. "Of all Trump’s ideas, the ban on Muslims is considered by his critics to be particularly off the rails," Jordan writes. "With 1.7 billion Muslims in the world, it aims to shut out nearly one in four people on the planet. It has been called racist, unconstitutional and unenforceable. Democratic front-runner Hillary Clinton has said that it is 'shameful' and 'dangerous.' Yet the idea turns out to have broader support than many of Trump’s critics expected. Nationally, 64 percent of Republican voters said in a recent Washington Post-ABC News poll that they approve of the ban—and so did 45 percent of independents—while 26 percent of Democrats did." Poor people pay more for everyday purchases, says a study by Harvard University graduate student Xavier Jaravel. 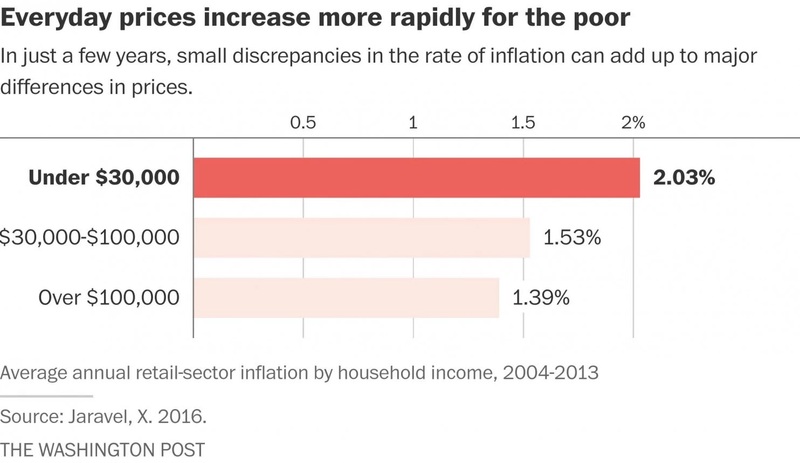 He found "that prices are increasing by more than 2 percent a year on average for goods purchased by consumers with household incomes under $30,000, but by just 1.4 percent annually for those with incomes above $100,000," Max Ehrenfreund reports for The Washington Post. "While apparently small, that divergence—if it continues—would become hugely important in a relatively short period of time. 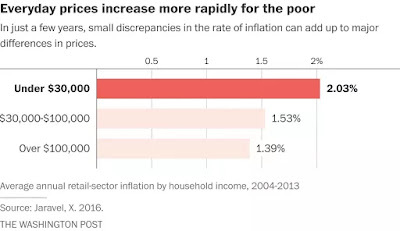 After 20 years, for example, every dollar in the pocket of a poor consumer would be worth just 88 cents compared to what a wealthier consumer would be able to buy with it at the grocery store, given the differences in inflation and in both consumers' preferences." The study found that the difference between what poor and rich people pay for products "resulted from the fact that within specific kinds of products—beef jerky, say, or tortilla chips—more affluent consumers were buying premium brands, and those brands' prices were more stable over time," Ehrenfreund writes. Jaravel "found that relatively few new products made it into stores that weren't premium goods. In other words, poorer consumers were more likely to be buying the same products from year to the next. When a new product arrives on shelves, retailers typically have to discount the price of older products somewhat. Using data on markups from a large national grocer with a few hundred stores, Jaravel found that the absence of new products for poorer consumers allowed grocers to increase the prices on the old products more from year to year." There are currently about 1,000 such groups, up from 150 in 2008, said Mark Potok of the Southern Poverty Law Center, which monitors extremism. "Potok and other analysts, including law enforcement officials who track the groups, said their supporters number in the hundreds of thousands, counting people who signal their support in more passive ways, such as following the groups on social media," Sullivan reports. "The Facebook page of the Oath Keepers, a group of former members of police forces and the military, for example, has more than 525,000 'likes.'" "There’s yet another natural resource we’re squandering, but the fix is easy, Just turn off the lights," Orttenburger. "We don’t really think of the night sky as a natural resource, maybe because we don’t see it as much more than an aesthetic pleasure – if we see it at all. 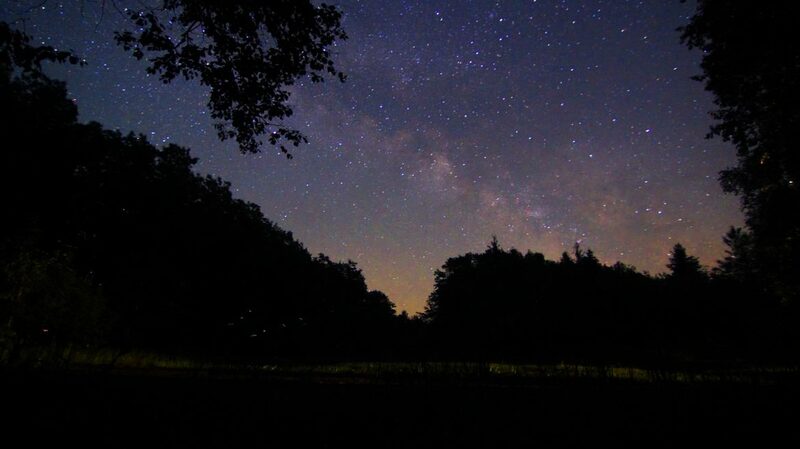 But the truth is, a dark night sky plays much more of a role in the natural world than we credit it for, and light pollution interferes with that role." To listen to a podcast with Orttenburger interviewing members of The Headlands International Dark Sky Park click here. If you have a cool $1 million sitting around, a rural West Virginia town three hours outside Washington, D.C., could be yours for the taking. 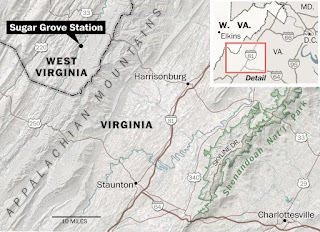 Sugar Grove, W.Va, which includes "80 homes on 122 acres, together with a gym, full-size basketball court, bowling alley, soccer field, and police and fire stations," is on the market for $1 million, Lori Aratani reports for The Washington Post. Keeping up the extensive grounds costs the federal government about $4.6 million per year. The town, which also includes 12 guest cabins, is "nestled between the Allegheny Mountains and the South Fork of the Potomac River," Aratani writes. 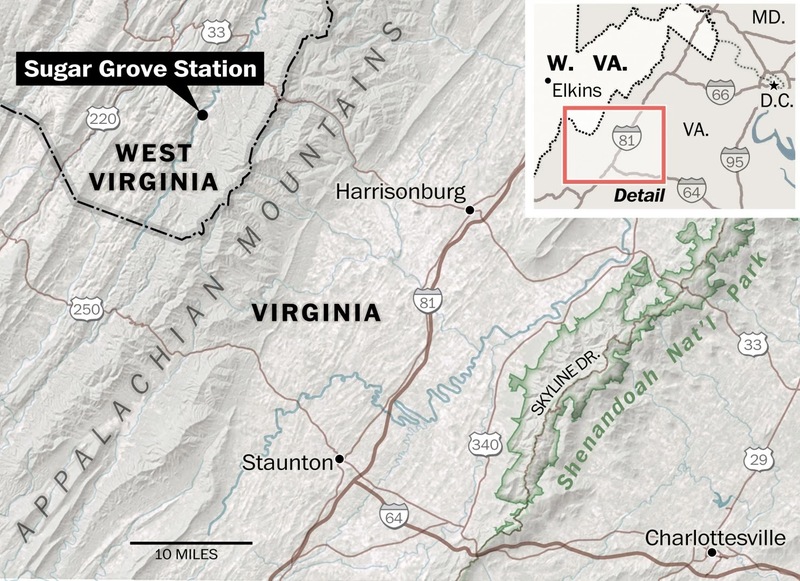 It's seven miles from George Washington National Forest "in the midst of a 13,000-square-mile area of the U.S. known as the National Radio Quiet Zone. All radio communications in the area are restricted." Online bidding began in February, but has yet to receive any takers. The town's lifeblood was the Sugar Grove Station naval base, which closed in September, leading to mass layoffs, Aratani writes. One problem is the secrecy of the base's nature. Documents leaked by Edward Snowden in 2013 revealed that the base was "one of 10 'signals-intelligence activity designators' used by the National Security Agency to collect international cellphone location information and other data. An array of giant parabolic dishes obscured by thick forest cover are housed on a mountain ridge just over a mile southeast of the main property. These, however, are not part of the sale. The NSA, through a spokeswoman, had no comment on the matter."